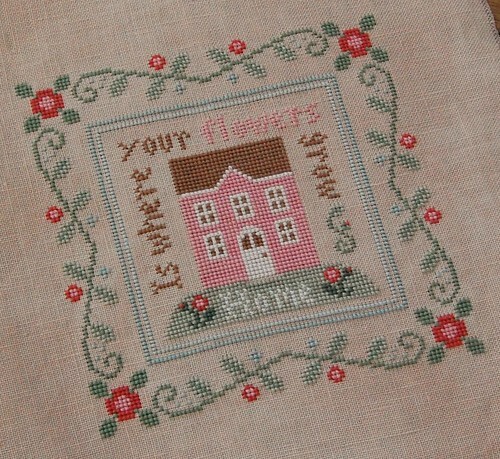 Nicole's Needlework: Rose Cottage Finished! Country Cottage Needleworks "Rose Cottage"
I think I will get back to Heart of America or another one of my many neglected wips! :) Write later! It is just beautiful Nicole! You did a fantastic job on it! It went really fast it looks like to me! You work so quickly, I am impressed. "Finally finished"?? LOL! I wish I could finish something so pretty so fast! It looks lovely Nicole. Your thread changes have come up well, and I know what you mean about chart pictures - they don't always look the same once stitched. You still should be happy though, it's so pretty! Oh I love your changes Nicole! That is a darling darling project. Thanks for the pic! It looks great! I know we always doubt ourselves when we make changes, but I think it makes it more of our own piece that way. I think it's just gorgeous!!! I have just found your blog and have enjoyed so much seeing this piece come to life - congratulations on a job well done. Well I think it is just perfect! Great stitching like always! Terrific, the colors are nice. It's lovely, Nicole. Congratulations on another quick finish! your making my LHN/CCn addiction grow! I love it! The colours are so pretty! So cute! I do like the changes you made. You are so fast too!